Photos of giant snakes being held by multiple people can bring a sense of wonder to those who have seen the photographs. People would wonder how many animals have fallen prey to these beasts. There are many vintage photos of giant snakes in the Philippines. The earliest ones can trace its origins from the first years of the 20th century during the American occupation. These gigantic beasts ruled the lush jungles of the Philippines and terrorized natives in their wake. There are many accounts written by American researchers about the thriving population of giant reticulated pythons deep in the Philippine jungles. The earliest undated photo shows 8 people(3 uniformed US Army men and 5 Filipinos) holding a skinned giant boa constrictor that grew 29 feet and 7 inches in length! Before the widespread deforestation of the Philippines, these snakes are the emperors of the deep jungle. A researcher named Thomas Headland did an immersive research of the giant reticulated pythons in the Philippines. 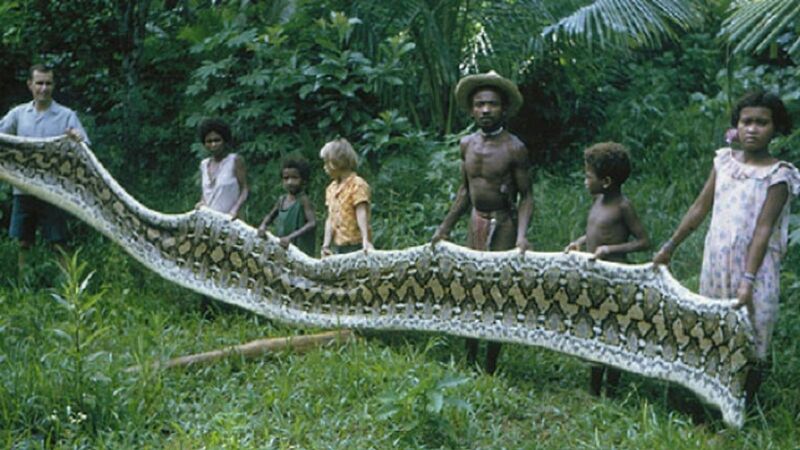 He lived with the Agta tribe in 1976 and routinely observed the giant snakes in their natural habitat. His research did not succeed if not for the cooperation of the Agta tribe. He frequently scouted with the tribesmen to face the pythons and they managed to capture large specimens that exceeded the normal length of the python. One snake grew for over 25 feet and it was held by many locals. Mr. Thomas Headland interviewed the locals about how the snakes behaved on their natural habitat, he felt disturbed by what he heard from the locals. It turned out that the snakes terrorized their villages and in one tragic twist of fate, a tribe member was swallowed whole by a large reticulated python. He also found out that smaller reticulated pythons attack the villagers when they go on a hunt for food or pick wild fruits deep in the jungle. Colored and black and white photographs of Mr.Thomas Headland along with the Agta tribe proved that the forests were once ruled by giant pythons. It is a widely accepted fact that a large population of snakes is a sign of a balanced ecosystem. The pythons installed themselves at the top of the food chain. Being unchallenged by other predators, the snakes reached lengths that people once thought to be nearly impossible. The widespread deforestation of the Philippines depleted the population of these giant snakes. Being a sign of a healthy ecosystem, they died out together with their former enclaves. Will these giant snakes just be a memory of yesterday? Only time will tell.